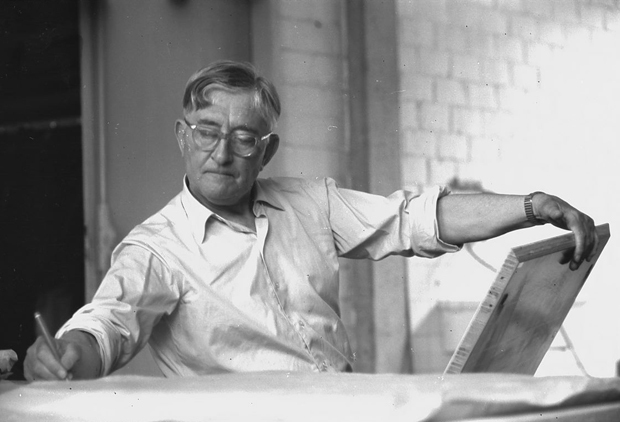 Josef Albers during his teaching at the College for Design in Ulm in the spaces of the Ulm Community College, 1954. I feel like I’ve put together a special little post for all of you today, content that I’ve not come across before and that has historical value in the design field. 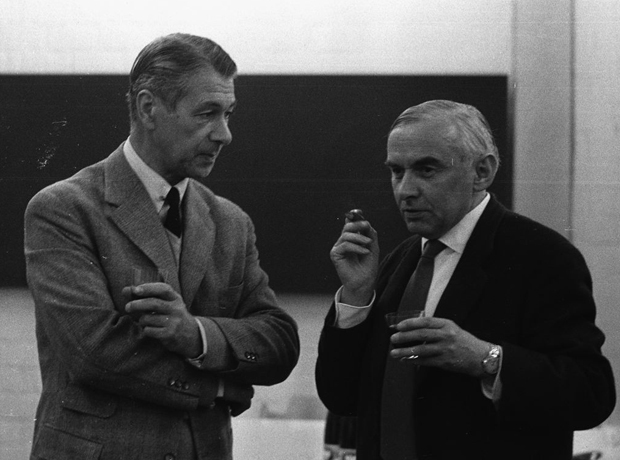 You may have come across the Ulm School of Design before, it’s also been mentioned here on the site quite a few times in the past, and today this features some imagery of well-known individuals that were photographed in the school. For a little introduction to the Ulm School of Design I’m going to explain a bit about the college. It was based in Ulm, Germany and was founded by Inge Aicher-Scholl, Otl Aicher and Max Bill, former student of the Bauhaus, in 1953. The school quickly gained international recognition and is often viewed as being second only to the Bauhaus as the most influential school of design. They had several departments, in each section, such as filmmaking or product design, the college was trying to implement new approaches to the design processes, much like the Bauhaus did in their time. 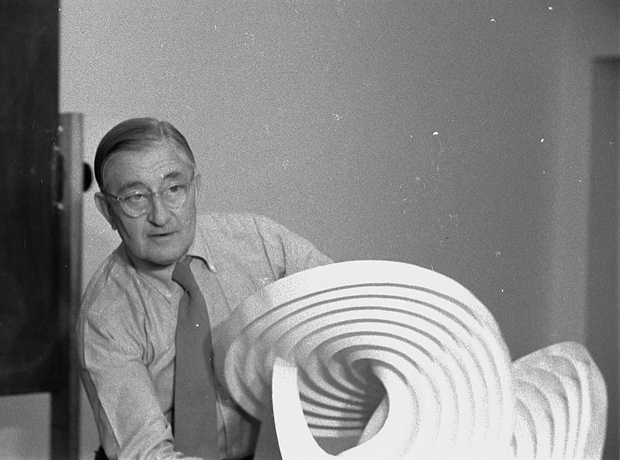 Although the school ceased operation after fifteen years in 1968, their model for teaching design still exists today and is often referred to in the education system worldwide. As you can imagine many well-known creatives turned up at the college to give their opinions and thoughts, one such individual who documented quite a few of the ongoings in the Ulm school was photographer and graphic designer Hans G. Conrad. His photography is what you can see before you today and has gifted us a small insight into who these designers were and the atmosphere around the building designed by Max Bill himself. I want to say a special thanks to Rene Spitz who gave me permission to use this imagery on our website, and there are plenty more to view on his Flickr stream. You’ll be amazing at the quality of the photography and the amount of inspiration, it’s had me enthused for quite a while this week. So I’ve picked out some of my favourite individuals to give you a taster so you can pop along to the links below to explore more, here we have Josef Albers, Walter Gropius, Max Bill, Buckminster Fuller, Tomas Maldonado, Herbert Bayer, Charles Eames and Ludwig Mies van der Rohe. 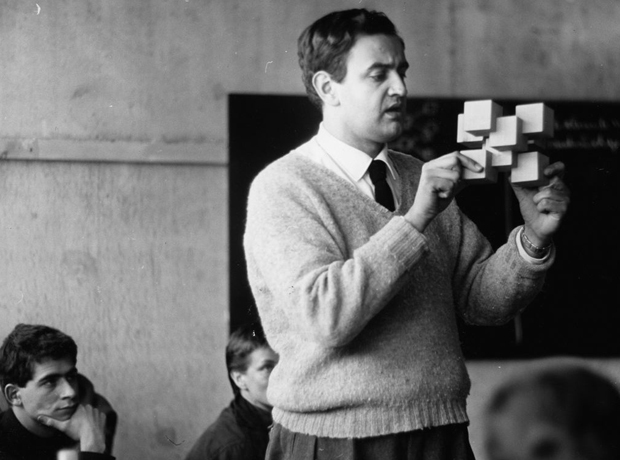 I’m sure just seeing this list has peaked your interest, such it did mine, with the photographs showing Charles Eames for example talking to the students, also Josef Albers seen above sketching down some ideas. Stunning to see the look on their faces as they’re exchanging words with the students, and teaching or talking about some of their ideologies, I would of been like a sponge soaking it all up if I was present. I’ll leave you to gander now, but I’d highly recommend visiting both pages owned by Rene Spitz as he’s got some unique content and has been publishing these wonderful photos that were given to him several years ago by Hans G. Conrad personally. Hopefully there are many more to come! 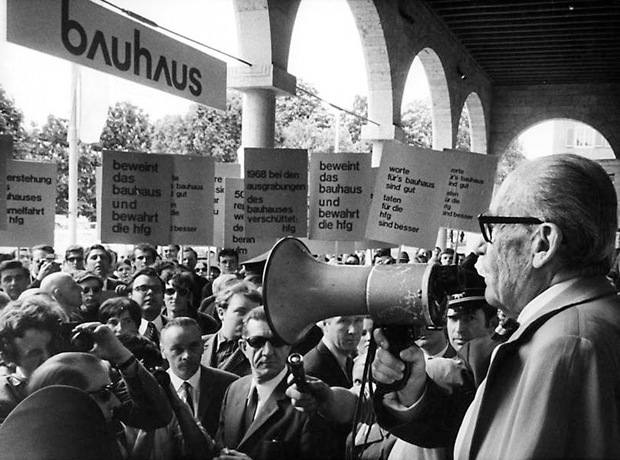 Walter Gropius, speaks during the opening of the Stuttgart Bauhaus retrospective demonstrating HfG students, 1968. 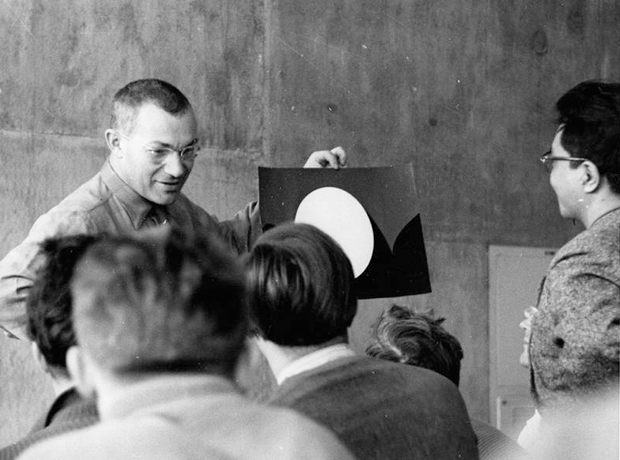 Max Bill during his teaching at the University for Design in Ulm, 1956. For Buckminster Fuller and Tomas Maldonado in college Design in Ulm, 1958. Faculty and staff of the College for Design in Ulm, 1954/55. 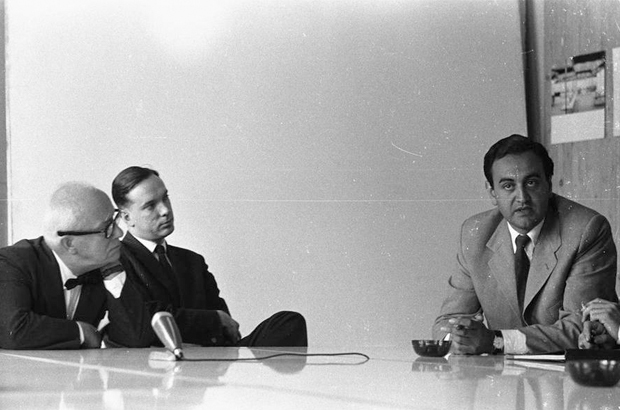 Herbert Bayer and Vordemberge-Gildewart in the College for Design in Ulm, 1958. 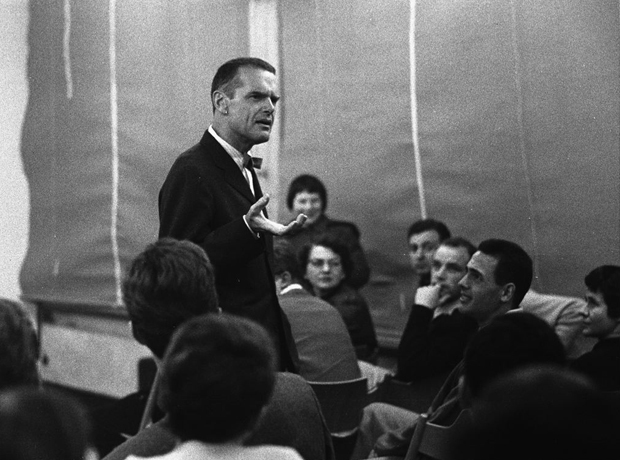 Charles Eames collection presenting three films in the Academy for Design in Ulm, 1958. 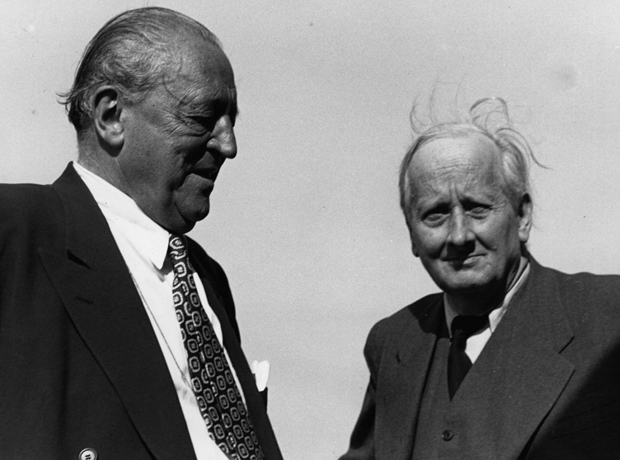 Ludwig Mies van der Rohe and Hugo Haring visit the site of the Academy for Design in Ulm, 1953. 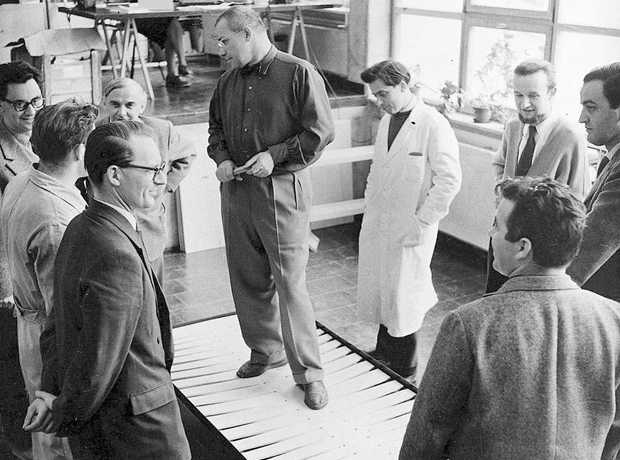 Tomas Maldonado during his teaching at the University for Design in Ulm, 1956.